Your organization grows, and it’s not practical at some point to assign permissions to individual users, you need to assign the permissions to all customer users of a customer. OTRS allows you to assign group permissions to a customer. Access works just the same as for agents, preventing a customer from modifying and viewing a request. Thus allowing the customer to focus on the results of the original communication and funneling the discussion through one ticket. Assign a single customer user to a group using Customer Users ↔ Groups. Use this screen to add one or more customers to one or more groups. To use this function, at least one customer and one group need to have been added to the system. The management screen is available in the Customers ↔ Groups module of the Users, Groups & Roles group. To be able to use this feature, you have to activate its setting first. Click on a customer in the Customers column. 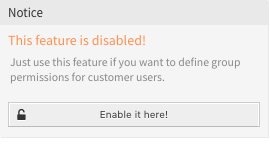 Select the permissions you would like to connect the customer to groups with. Select the permissions you would like to connect the group to customers with. Click on the Edit Customer Default Groups button in the left sidebar. Add or modify groups in setting CustomerGroupCompanyAlwaysGroups. These groups are automatically assigned to all customers. If several customers or groups are added to the system, use the search box to find a particular customer or use the filter box to find a particular group by just typing the name to filter. Multiple customers or groups can be assigned in both screens at the same time. Additionally clicking on a customer or clicking on a group in the relations will open the Edit Customer screen or the Edit Group screen accordingly. Accessing a customer or a group provides no back link to the relations screen. Gives customer users group based access to tickets from customer users of the same customer (ticket CustomerID is a CustomerID of the customer user).